Disturbances in the liquid tend to complicate liquid level measurement. 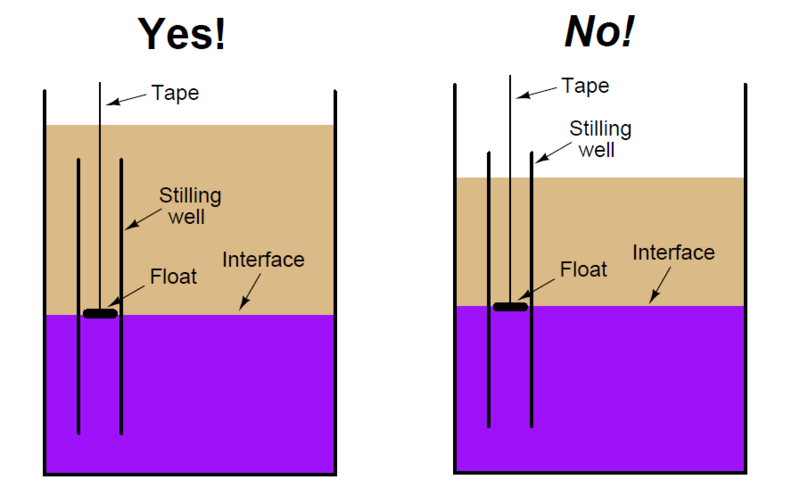 These disturbances may result from liquid introduced into a vessel above the liquid level (splashing into the liquid’s surface), the rotation of agitator paddles, and/or turbulent flows from mixing pumps. Any source of turbulence for the liquid surface (or liquid-liquid interface) is especially problematic for echo-type level sensors, which only sense interfaces between vapors and liquids, or liquids and liquids. In the left-hand installation where the stilling well is completely submerged, the interface levels will always match. 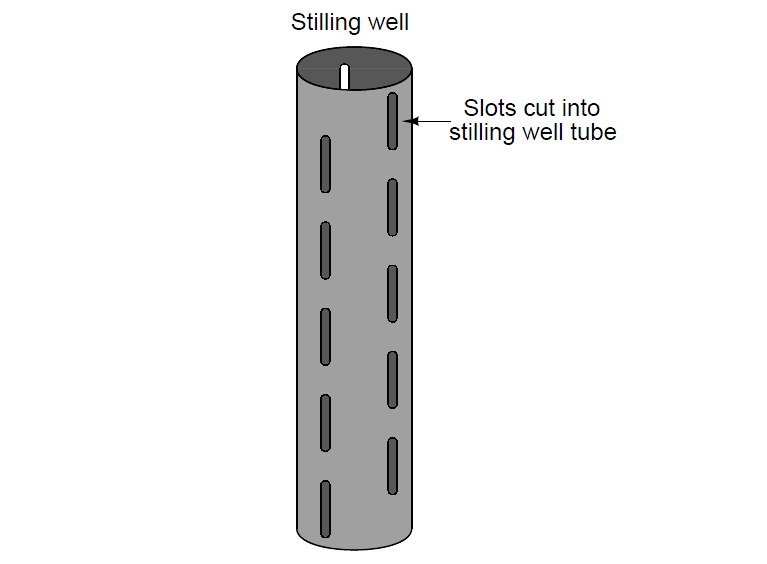 In the right-hand installation where the top of the stilling well extends above the total liquid level, however, the two levels may not always match. The problem here is analogous to what we see with sightglass-style level gauges: interfaces may be reliably indicated if and only if both ends of the sightglass are submerged ( for an illustrated explanation of the problem, check this Article CLICK HERE ). Such equalization ports are commonly found as a standard design feature on coaxial probes for guided-wave radar level transmitters, where the outer tube of the coaxial transmission line acts as a sort of stilling well for the fluid. 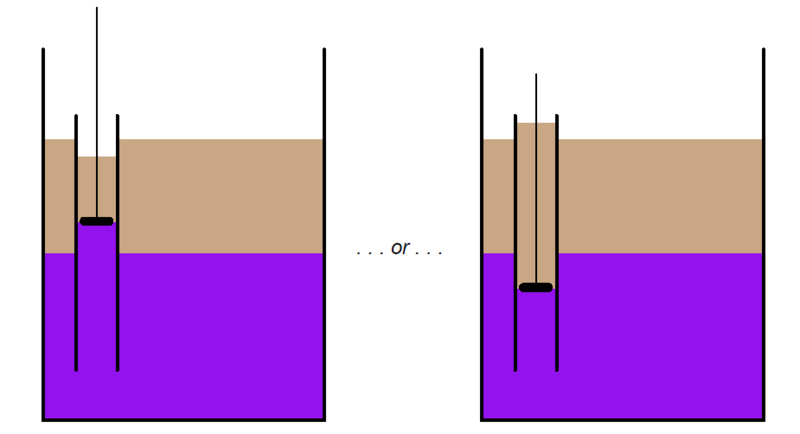 Coaxial probes are typically chosen for liquid-liquid interface radar measurement applications because they do the best job of preventing dispersion of the electromagnetic wave energy, but the “stilling well” property of a coaxial probe practically necessitates these equalization ports to ensure the interface level within the probe always matches the interface level in the rest of the vessel.